Leaving the top and going south, after descending several steps, you enter a fairly smooth terrace, which is called Sacred Square, perhaps because they could not find a better name, and possibly so named because in two of Its sides are the most important temples of the city, to accede to this place, it is passed in front of a rock located to the left of the route, its form simulates a gigantic clam, following the direction of the summit, you can see seven steps, Carved in the same block of granite, and from the top of the same, you will get a magnificent view, on the top has a platform with stones embedded, said platform, can support without problems three or four people, who wish to greet To the rising sun. To the north of the cliff are the small building walls ten or fifteen feet in diameter, constructed with the greatest skill by the builders of the Empire, with white granite blocks, carefully chosen, several of them apparently rectangular, The largest of polygonal shape, but all placed perfectly, without any type of forge or glue. The lower row, made up of particularly thin, rather long blocks, to the left of your door, as you enter it, you will notice that the lower half of the front wall is a single block of granite, and in Several points of this building, you will find parts that seem to boast, of a certain type of caprice and playful ingenuity. The corner carved into a huge single piece of granite, which in turn forms a small part of the outer wall; The palace of Inca Roca in Cusco, has a stone that the Spanish made famous for having twelve angles, this stone have thirty-two. This small building presents another unusual detail, a kind of sofa or stone stool, located on the opposite side of the door, which covers the entire extension from side to side, armed with finely cut blocks. Some, upon seeing it for the first time, take the impression, that this may have been the house of a high priest, but later studies determined that it would be a royal mausoleum for mummified corpses of Inca Emperors. The building in its interior, is lined by nicely carved niches, it can be appreciated, that the whole structure was worked looking to surround the perfection; Other Andean buildings can equal it in beauty, but none surpasses it. 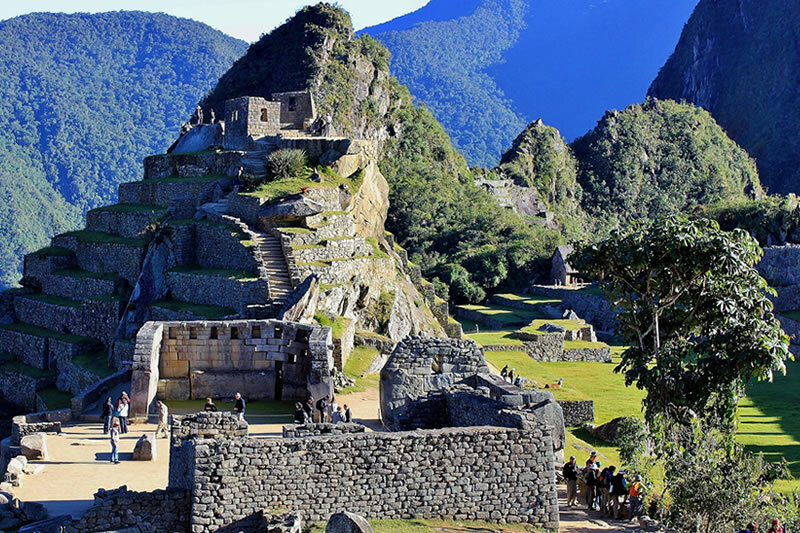 It is proof that Machu Picchu is one of the most beautiful sanctuaries built by the Incas, never surpassed by any other ancient town in South America. It is relevant that this beautiful building, this at the foot of the stairs that climbs up to the Intihuatana, and coincidentally is adjacent to the main temple. The Inca religion worshiped the sun god (Inti) and is strictly united to the royalty of the empire, therefore, the priests of the sun should have been, the most favored. Reason why, it should not be surprising that the stairs leading to the Intihuatana are the best construction in the entire Inca city, with steps four feet wide where each is a solid block of granite. To the north of this mausoleum, runs the slope of the Urubamba river, in the middle of a beautiful valley, four hundred meters below. From this he can deduce, that without a doubt, the builders of the Empire of the Incas, had great knowledge of the symmetry. On the south side of the square is a rectangular building, made of crudely finished small stones, stacked like adobe, with two doors and without windows, and although it was an important residence, it seems that it took months or even weeks to construct it. Possibly it was constructed after the escape of Manco Capac of the Cusco. At which time this sanctuary had to be enlarged to receive elected officials, priests and women fleeing Pizarro. At the eastern end of the square are the remains of the Temple of the three windows, with walls like those of the main temple, consisting of three sides, with the fourth, open to the square, and a single monolithic pillar, built to support the Roof of the structure. It is worth saying that when you see it live, it will offer you a great experience, on your trip to Machu Picchu.